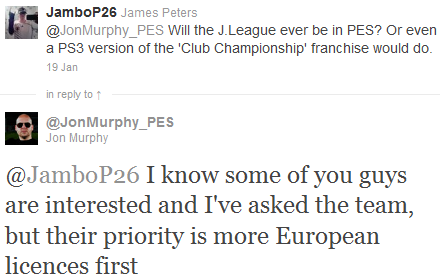 Jon Murphy has insisted that Konami have prioritized acquiring new European licenses, ahead of any other footballing region. It seems that fans of the top division of Japanese football have a long wait before the J-league is introduced into the Pro Evolution Soccer series - if ever. From a personal point of view, I agree with JM. I would put European teams first too. The market is there, and I would imagine that the majority of J-League fans would be playing Winning Eleven, rather than Pro Evolution Soccer.